I happened to have some left over clams this week. While you scratch your heads and think, who and why would anyone have left over clams, – I’ll just say that they were the delicious vestiges of the next round of the Lambs and Clams Contest, sponsored by the Charleston Food and Wine Festival. For more details on that, you will have to tune in next week for my official post and submission. Until then, let’s talk leftovers. More specifically, let’s talk chowder. I don’t know about you but when the weather chills down, I can’t think of anything more comforting than a bowl of piping hot, creamy chowder – blame it on my New England roots. So, this week, as the temperatures dropped and we had a deluge of rain, I found myself in the possession of some lovely clams, and I made this chowder. Use the smallest clams you can get your hands on, such as little necks, middle necks, or, if you are on the U.S. west coast, manila clams. 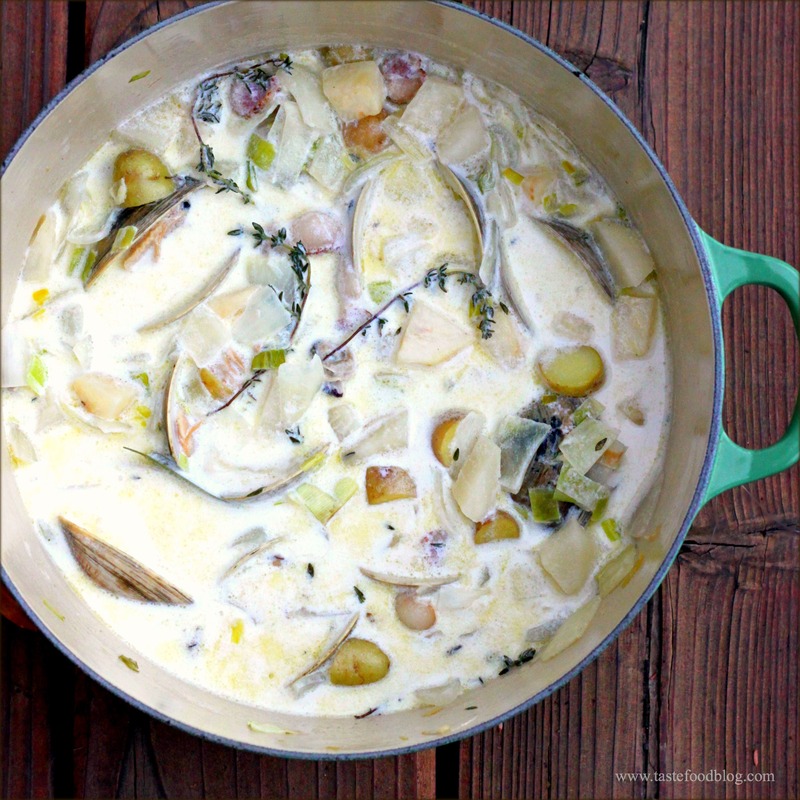 Typically, onions and potatoes accompany clams in a chowder. In this soup, I’ve also added leeks, celery root and turnips, which add flavor to the creamy broth, while maintaining a nice white color theme. Heat oil in a large pot over medium heat. Add bacon and fry until fat is nearly rendered (it will continue to render as the vegetables cook). Add onion and leek and sauté until softened, about 2 minutes. Add turnip, celery root and potatoes. Sauté until vegetables soften, about 5 minutes. Add milk, cream, stock, bay leaf and thyme. Bring to a boil then simmer until the vegetables are tender, 10 to 15 minutes. Add the clams. Reduce heat to medium-low, cover and cook until clams open, stirring occasionally, 8 to 10 minutes. Discard any unopened clam shells. Season to taste with salt and pepper. Serve hot garnished with fresh thyme sprigs. Scrumptious looking! That is something I’d love to make one day (with salmon). easy to make anything with butter and cream. what about tailoring to a more healthy lifestyle? As soon as Myles saw this, he said ‘you’ve got to make this!’. And so I will. Blame it on my years of living in New England, I love chowders! This looks so beautiful. The prettiest clam chowder I’ve ever seen. Best looking chowder I’ve ever seen. And lady, I’ve seen a lot of chowders. I want to run out right now and buy some clams. This is gorgeous!!! Can you believe that this native New Englander has NEVER made clam chowder? Thankfully this FAB recipe will change that sad fact. That looks INCREDIBLE!! I’m just posting my clams/oyster challenge recipes and clicked to see what you did 😉 I’ll have to come back for your challenge recipe. I think we have the same Le Creuset but in different colors. I’ve never once cooked with clams. You are making me rethink that…this looks divine. Chowder isn’t typically a pretty picture, but this one sure is! Wow, I’ve never been brave enough to make clam chowder at home, eventhough I adore it. Yours looks SOOOOO inviting. Might need to add this to the list. Comfort food at its best! Bacon, clams and cream… how can you go wrong? First I saw a New England Chowder and now this one.. I’ve got to make Clam Chowder.. Tomorrow is the day!! A most robust clam chowder recipe! The addition of black radishes or turnips adds depth of flavor to the rich broth. A very satisfying soup to warm the chill of autumn!